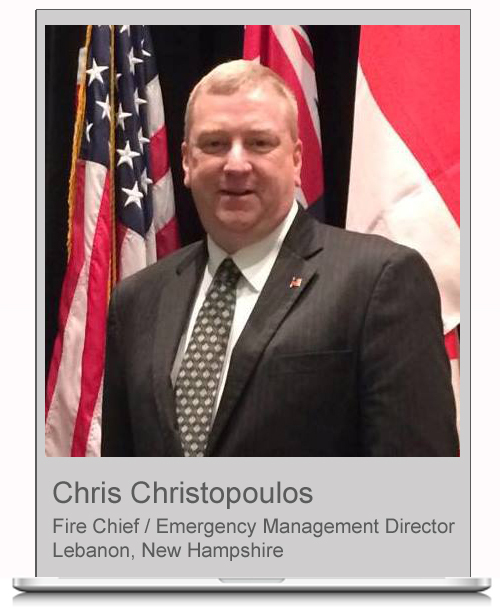 Chris Christopoulos, Jr. is a 35 year veteran of the Fire Service and currently the Fire Chief and Emergency Management Director for the City of Lebanon, New Hampshire. He is responsible for the administration and management of a combination Fire and Emergency Medical Services Department, serving of resident population of 15,000 and a daytime population of over 40,000. Additionally, he is responsible for the development of all City Emergency Plans and Emergency Operations Center activities during a major emergency. Chris chairs the Local Emergency Planning Committee, Regional Hazardous Materials Response Team, and Regional Public Health Emergency Preparedness Planning Region and represents the New Hampshire Fire Chiefs on the Governor’s Advisory Council on Preparedness and Security. Chris has been with the City for 15 years. Chris is a graduate of Mount Wachusett Community College in Garner, MA with an Associates of Fire Science, Granite State College in Concord, NH with a Bachelors of Science in Emergency Services Management and the Naval Post Graduate School, Center for Homeland Defense and Security in Monterey, CA with a Master of Arts in Security Studies. He holds certifications in Firefighter Level III, Advance Incident Management, Fire Officer I & II, Emergency Medical Technician, Hazardous Materials Technician and Fire Service Instructor. In 2009, Chris became one of just over 400 Fire Chiefs to receive the Chief Fire Officer designation from the Commission on Professional Credentialing. Chris began his Fire Service career in 1981 as a volunteer firefighter in his hometown of Wallingford, CT. He became a full-time firefighter-paramedic in West Haven, CT in 1988. In 1999, Chris moved to Rindge, New Hampshire to accept a position as Fire Chief-Building Inspector. In 2002, he was recruited by the City of Lebanon, NH for a Deputy Fire Chiefs position and was promoted to Fire Chief in 2007.